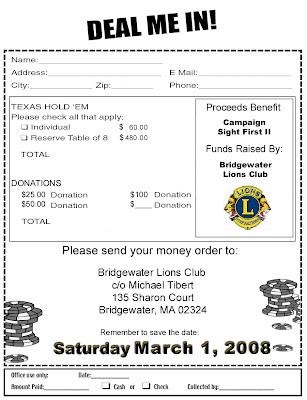 The Bridgewater Academy Lions will hold a meet and greet over tea on February 10, 2008 between 2 and 4 PM. This event is open to anyone looking to learn more about and possibly join the Bridgewater Academy Lions. The Academy Lions, a women's group, will host tea and orientation about the club and the meeting is open to the entire community. For more information and to reserve your cup of tea, please call Bev at 508.697.4919. A. Douglas Wachope and Louis Stewart will perform a trombone recital Tuesday at 7:30 PM in Boyden Hall's Horace Mann Auditorium at Bridgewater State College. Wachope is a professor at BSC and Stewart teaches at Berklee College of Music. The event is free and open to the public. For more information, call 508.531.1377. The Community Preservation Committee (CPC) in collaboration with Newport Collaborative Architects (NCA) will offer a citizens forum to gather ideas for the uses for 4 municipal buildings. The forum, a “visioning session,” will take place at the Senior Center on Wally Kruger Way at 6:30 PM on Monday February 25, 2008. Light refreshments will be provided and craft/drawing activities for children will be available in the meeting room. Transportation can be provided by calling the contact information below. The Community Preservation Act (CPA) was adopted by Bridgewater in 2006 to preserve and restore historical structures and documents, preserve open space and provide for affordable housing. The fund is supported through a 2% assessment on personal property tax in Bridgewater which is matched by state revenues collected from assessments on all real estate transactions. For the past two years, the state fund has matched the Bridgewater fund at 100%. In addition to awarding grants determined through a competitive process, the CPC is able to bond against future revenues for larger purchases or projects. CPA projects are presented to the town at the spring Town Meeting. CPA funds are spent only after receiving town meeting approval. At the 2007 spring Town Meeting, the Bridgewater citizens voted for the CPC to select an architectural firm to study the use, preservation and restoration of the Academy Building, the former McElwain School building, the Memorial Building and the Town Hall. NCA was chosen in early December 2007 after a competitive bid process and has met with town department heads, boards and committees to determine their office and meeting space needs. Now it is an opportunity for residents to contribute on February 25th. Please contact the CPC with questions or to provide ideas if you cannot attend the February 25th session at marilee@thehunts.org or phone (508-697-3681). Post in the comment section who you plan on supporting and why. And look for next week's poll question about the Selectman's race! The Rotary Club of the Bridgewaters announces their next meeting. To make a reservation to attend, call Bruce Marquis at 508.378.7890. Class is taught by instructors from the American Heart Association and Healthcare Educational Resources. To register, call 508-697-5800 or click here to visit Healthcare Educational Resources website. The cost of this training is $35. Annual Presidents Party at the Bridgewater Vets Club. Tickets are $15 each and can be purchased at the Vets Club in advance. The next Citizens for a Better Bridgewater meeting will be held this Sunday, January 27th from 7 to 9 pm at the St. Thomas Aquinas Parish Center. Among the topics of discussion will be: updates from CBB Committee Chairs, an overview from the BOS on the budget process, and discussion on the various Committees now underway (Government Study Committee, School Study Committee, etc.). The Bridgewater Garden Club announces their first meeting of the 2008 season. 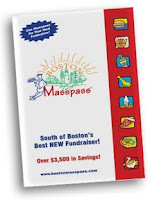 On January 23, 2008, the Bridgewater Garden Club will meet at the Senior Center at 1 PM. A demonstration on jams and jellies by Mary Beers from the Thornton Burgess Green Briar Jam Kitchen in Sandwich will take place. Any residents of Bridgewater looking to join the Bridgewater Garden Club are welcome to attend. 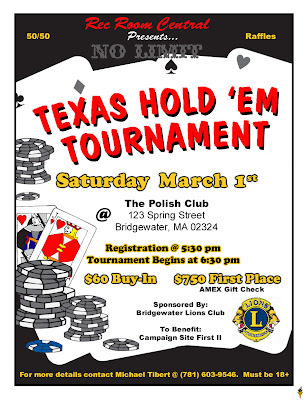 For more information about the club, please call 508.697.7617. 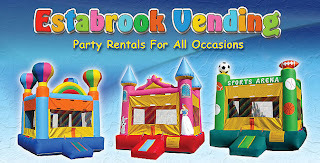 Estabrook Vending, owned and operated by Bridgewater resident Peter Estabrook, is proud to announce a business expansion to now include party supplies, jumpies and more! Estabrook, who has run the vending business since 2005, states that by providing a new party supply business that he will be able to greater serve the Bridgewater area. "The vending business has been nothing but great," said Estabrook. "But now that we are able to service events like birthday parties, cookouts and community events we really think that our success will grow." Estabrook Vending offers free delivery of party supplies to Bridgewater residents and businesses.